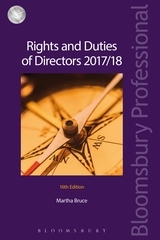 Rights and Duties of Directors 2018/19 is a highly practical and comprehensive publication which clearly sets out the rights and powers of directors and their duties. Highly practical and comprehensive, it details each and every duty in relation to the core administration, compliance and disclosure requirements of company law and other closely associated legislation. The 17th edition is fully revised and updated to take account of the wide ranging changes and new case law since the 16th edition. 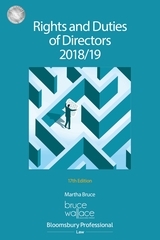 Martha Bruce FCIS is a Chartered Secretary and director of Bruce Wallace Associates Limited providing practical company law advice and assistance to both private and public companies.